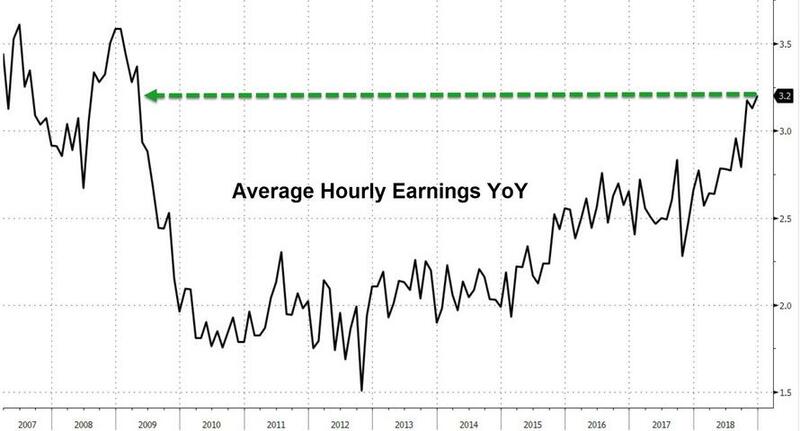 While on the surface today's blockbuster jobs report was "goldilocks" in almost every possible way, if clearly negating a "recession is coming" narrative and crushing any hopes for an imminent rate cut (with Powell on deck expected to provide more clarity), there was one negative message for stocks, namely the fastest increase in wage growth since 2009. Why are rising wages - which is a welcome development for America's record 156,945,000 employed workers - potentially bad news? Because as Bloomberg's Anchalee Worrachate notes, "it's a threat to the corporate profit outlook, and equities globally, if the experience of Apple's revenue forecast cut was anything to go by." 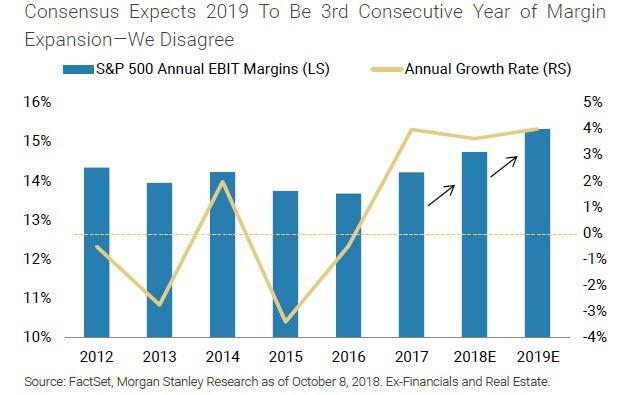 Indeed, as the following chart from Morgan Stanley shows, in 2019 consensus expects profit margins to post a 3rd consecutive year of expansion. Should wage growth persist at this rate, this number will have to be revised lower. Sharply. Explaining further, Worrachate notes that "while U.S. corporate profit margins hit 11.2% last year, the highest in at least 18 years, rising wages in a tighter jobs market are a real threat. Especially in the context of higher rates, and an economic slowdown that may keep companies from being able pass on the rising costs to consumers." It's not just rising wages, of course - rising tariffs also threatens to put a cap on profits. According to HSBC, the current 10% tariffs could take away just 1% of index earnings. Of course, if trade talks on Monday produce no progress - and eventually lead to an even higher, 25%, tariff imposed on all Chinese products, this would wipe a total of 4.5% points from U.S. earnings growth this year. In other words, what's great for America's workers is bad for the stock market. For now, however, the algos that are in charge of the S&P500 this morning have yet to figure that out.